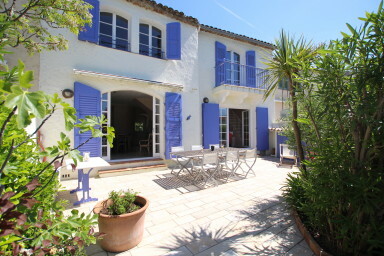 This gorgeous double house on 2 levels is located in a private area of Port Grimaud. The beach is only a few minutes away by walk. On the street side, a wide sunny terrace perfect to have breakfast under the sun, surrounded by plants. On the canal side, a large terrace with flowers where you will relax quietly and enjoy the sunset view. - on the ground floor, a living-room, a dining-room with an open kitchen and a shower-room with toilets. - on the 1st floor, 2 sleeping areas: on one side 2 bedrooms with a double bed, a small bedroom with a sofa-bed and a shwoer-room and on the other side, 1 bedroom with a double bed and 1 bedroom with 2 single beds and a shower-room. In front of the house, a double 11m mooring. 2 numbered parking spaces near-by. A lovely house for idyllic holidays with friends or family.